I started getting serious about my Halloween outfit after a few years of buying those cheaply made crap that everybody else is wearing, or the beautifully designed costumes but are overly-priced. Maybe it's in my blood that I always wanted to be different, or that I dislike to purchase ready-made costumes (just not cool enough), I began making my own costumes for Halloween. 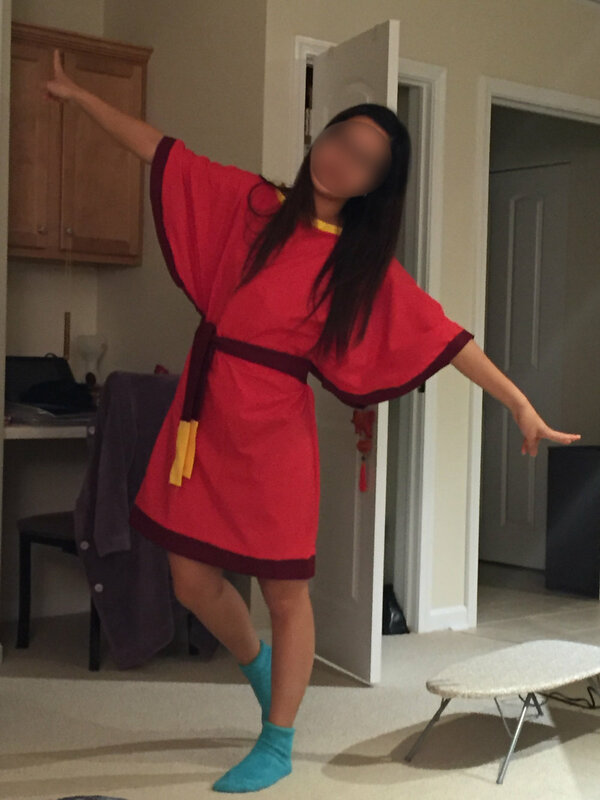 Of course, all of the costumes I've made since then have been Disney characters :) The Emperor's New Groove is for sure one of the best movies Disney has ever produced, but there is not a lot of ready-made Kuzco costumes out there for people to purchase - BOOM BABY! Kuzco it is! It was probably the costume I'm most proud of among my other Halloween projects. At first I tried making the head piece by paper mache-ing on top of a hat (covered in saran wrap so it doesn't stick) using a head-shaped Styrofoam as a support. The result was a complete disaster! The surface wasn't smooth at all and it doesn't fit on my head properly. Second time I did it on balloons (with some oil on the surface to prevent sticking) and the result was great! I then cut out the semi-circle shape from a sheet of paper board, taped it to the dome base and paper mache over the connecting part. Once dried, I applied a few layers of Mod Podge over the entire exterior so the surface is smoother for paint. Lastly, I painted the headpiece with gold acrylic paint (multiple layers) and added the final touch (the lines) using fabric ink so it feels a little more 3 dimensional. I really enjoyed making (and wearing) this costume but now I am having a hard time coming up with a new idea to top this one! Any suggestions?